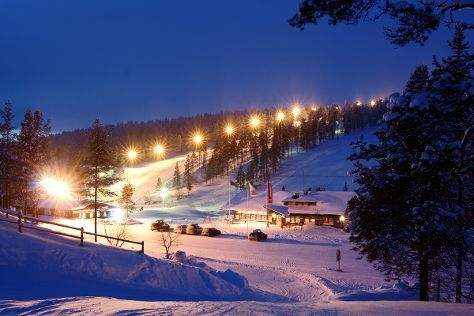 Start off your visit on the 19th (Fri): hit the slopes at Saariselka Ski & Sport Resort. To see other places to visit, more things to do, where to stay, and tourist information, read our Saariselka day trip website . London, UK to Saariselka is an approximately 14.5-hour flight. You can also drive. Due to the time zone difference, you'll lose 2 hours traveling from London to Saariselka. Traveling from London in April, things will get little chillier in Saariselka: highs are around 3°C and lows about -6°C. Cap off your sightseeing on the 19th (Fri) early enough to go by car to Kittila. Kittilä is a municipality of Finland and a popular holiday resort.It is located in northern Finland north of the Arctic Circle within the Lapland region. On the 20th (Sat), don't miss a visit to LUVATTUMAA - Levi Ice Gallery, then get your game on at Kid's Land, then take an exotic tour of a safari tour, and finally make a trip to Giewont Husky Adventures. On the 21st (Sun), you'll have a packed day of sightseeing: stop by Elan Ski Shop & Rental and then get outside with Seven Fells Up. To find traveler tips, maps, reviews, and other tourist information, refer to the Kittila sightseeing tool . You can drive from Saariselka to Kittila in 3 hours. Alternatively, you can take a bus; or take a bus. In April, plan for daily highs up to 3°C, and evening lows to -4°C. Wrap up your sightseeing on the 21st (Sun) early enough to drive to Kemi. Kemi is a town and municipality of Finland. Kick off your visit on the 22nd (Mon): take in the spiritual surroundings of Kemi Church and then take in the architecture and atmosphere at Tornio Church. To see other places to visit, photos, where to stay, and more tourist information, refer to the Kemi trip itinerary maker website . You can drive from Kittila to Kemi in 3.5 hours. Alternatively, you can take a bus; or do a combination of bus and train. Expect a daytime high around 4°C in April, and nighttime lows around -5°C. Finish your sightseeing early on the 22nd (Mon) to allow enough time to travel back home.